Thinking of being a dancer but afraid of the harsh training? Then consider joining Scottish Dance Theatre (SDT)’s creative workshop. SDT is one of the UK's leading dance theatre companies. It is also part of Dundee Rep Theatre's creative community. SDT is constantly stretching the skills and talents of dancers and tours regularly throughout the UK and internationally. Currently, it is on its first tour in China, holding workshops in Shanghai, Beijing and Guangzhou and delivering dance performances in Shanghai and Beijing. The workshops use the company’s performance work as the impetus for creative work, and are tailored to suit the different ages and levels of pupils, while exploring participants' own movement choices, possibilities and creativity. 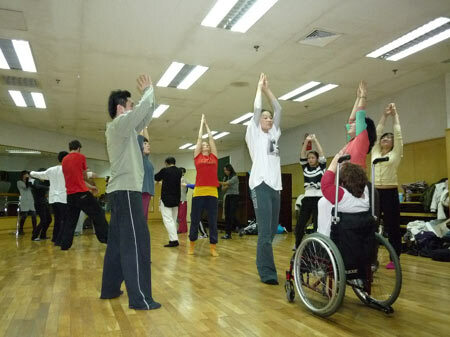 Janet Smith, artistic director of SDT, said the workshop aims at freeing everyone to explore their own world. During the two-hour workshop session at Peking University on November 3, Smith showed movements like “listening”, “shy samba”, “collapsing” and “large samba” to 25 participants, encouraging them to make any combination they felt comfortable with, and gave timely feedback on their performance. “After watching what you have done, I am a little diverted. This whole process is not refining arts but defining arts. And I think I may have to redefine what contemporary dance is,” Smith announced at the end of the workshop. SDT gave an impressive performance on November 1 in Shanghai and will deliver two more performances on November 6 and 7 at Mei Lanfang Theatre in Beijing.